We have been hearing and thinking a lot about the importance of our privacy in these recent days. We have always taken data protection very seriously. We want you to know that you can trust us to respect your privacy and keep your personal information safe. Legislation aimed at giving you more control over this is called the General Data Protection Regulation (GDPR). Here at Duende As Art, we collect personal information when you place an inquiry; you register with us, or place an order for products or services. We will use this information to provide the services requested, maintain guarantee records, and, only when you ask us to will we send you newsletters and events information. The Data Protection Regulation allows you to have more control over what happens to your information too. For instance, if you don’t want our news and events information anymore, we will stop sending them to you. Of course, we will still keep you informed about any services or products you have purchased from us. We have created beautiful original paintings on paper, and we have decided that the best way to offer them to you is without frames. We are artists, not framers. That being said, we want to share what we have learned about framing and caring for your original painting on paper. The best way to have your work framed is to take it to a professional. They know everything about conservation and will also help you make a beautiful frame selection. Some of our paintings on paper come in an archival mat. These paintings come ready to place in an 11x14 inch frame. The mat keeps the painting from touching the glass. There are two things to consider when framing these paintings. Most ready made frames come with regular glass. It only protects your artwork from dust and scratches, but it does not protect your artwork from harmful UV rays or contain any anti-reflective properties. You can replace this glass with Museum conservation glass, which will protect your artwork from harmful uv-rays as well as preventing unwanted glare. Once the artwork is in the frame, framer's points or linen tape can be used to seal the space between the contents and the frame. It is good to then glue or tape a thin layer of paper across the back, from one edge of the frame to the other. This keeps dust from entering the frame. Humidity can really harm artwork, and cause it to warp even mold. Make sure that your painting is in a climate controlled environment. Some of our paintings feature a deckled edge. These paintings require one more step in the framing process. In order to ensure that the glass does not touch the painting, we recommend using and art/glass spacer. This can be placed on the outer edge of the glass, which will be hidden by the lip of the frame. We have purchased small amounts at our local Hobby Lobby, in the framing department. Large quantities can be purchased at online art stores like Jerry's Artorama, even on Amazon. We have just released a collaborative book of Stephen R. LaDue's poetry, accompanied by details of our paintings. We created this book to honor and remember his life and words. Steve has known Katherine since childhood, and he shared a lot of his poetry with her over the years. Last year we created a one off of this book, as a gift for Steve. He loved it, and asked us to make it available for his friends and family. With his recent passing, we decided to share it not only with friends and family, but with the world. LaDue's life and his words are meaningful, and we hope you will cherish them, as we do. GREENFIELD – The Warren Cultural Center in Greenfield is the destination of a treasure from Aug. 1 to Sept. 30 in housing the Duende as Art display, Heartland Homecoming. Duende is a Flamenco Dance term which means “when the Spirit and the dancer become one.” Its website is www.duendeasart.com. What makes this particular art show of abstract acrylic paintings so unique is the paintings are done collaboratively by three artists. The trio has a diverse background with Katherine Rody from Wisconsin and Angela Meijer born in Oregon, while Adriaan Meijer hales from the Netherlands. Life has brought them to Ankeny. This artist collective has no preconceived visions of what the finished art may become as it is a flow of change. A work may take an entirely different direction by one of the artists introducing a new idea and by the others adding new twists. At times, each may take a turn on a painting as a soloist, but at other times they simultaneously paint together. All three artists deeply identify with these co-created works. For more information, visit www.warrenculturalcenter.com. 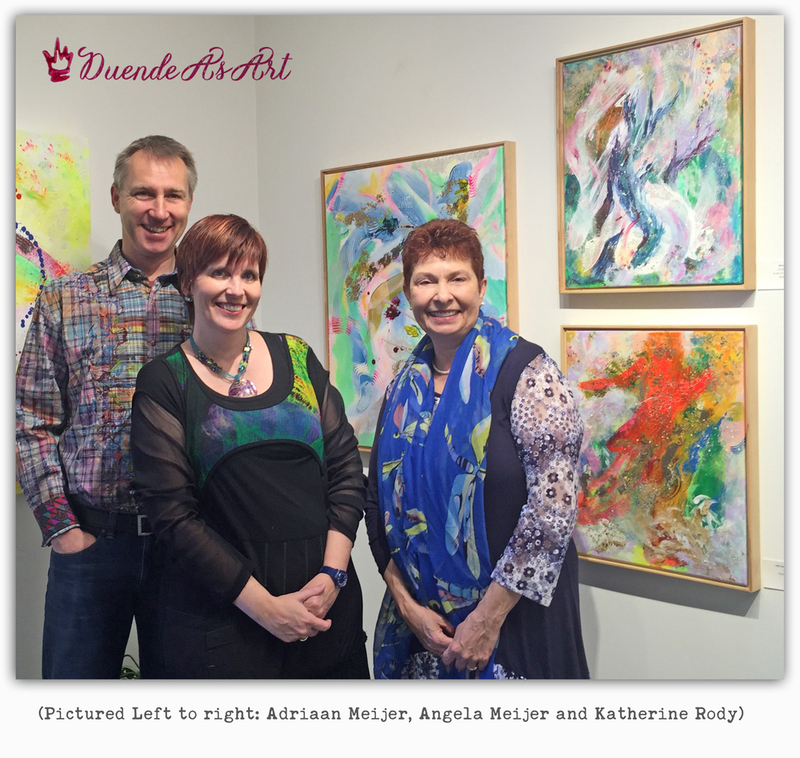 Artist Collective: Duende As Art - Katherine Rody, Adriaan Meijer and Angela Meijer at the reception of "Heartland Homecoming" at Warren Cultural Center. What if there was an undiscovered treasure in your backyard or in your corner of the state? What if it was something that could heal your heart or awaken your imagination? What if it challenged or inspired your thoughts on humans working together? Greenfield's Warren Cultural Center (www.warrenculturalcenter.com) is the destination of a treasure in housing the Duende as Art display, Heartland Homecoming, August 1 – September 30, 2016. Duende is a Flamenco Dance term which means “when the Spirit and the Dancer become one”. Their website is www.duendeasart.com. What makes this particular art show so unique is that the paintings are done collaboratively by three artists. The trio have a diverse background with Katherine Rody from Wisconsin, and Angela Meijer born in Oregon, while Adriaan Meijer hales from the Netherlands. Life has brought them to Ankeny. The initial reaction of many to the abstract acrylic paintings has been in noting the delightful play of warm and cool colors. Rich textures provide a feast for the eyes. Large scale 4' x 5' pieces invite the viewer to choose between up close and personal or across the room viewing. Small 6” x 6” works provide an intimate experience. Viewers may be curious as to their working process. This artist collective has no preconceived visions of what the finished art may become as it is a flow of change...much like life! A work may take an entirely different direction by one of the artists introducing a new idea and by the others adding new twists! At times each may take a turn on a painting as a soloist, but at other times they simultaneously paint in concert with a finely choreographed oneness. These artists epitomize working together. There are degrees of working together. The artisans have moved from the concept of committee, beyond community to a sense of spiritual communion in their work. All three artists deeply identify with these co-created works. Those who have not indulged in artistic practices may not realize that many artists consider their artworks as their own children! Asking an artist which of their works is their favorite is like asking which is their favorite child! These paintings beg our eyes to dance through them. They beckon us to delve into the depths of the intricate layers of paint and reflective specks of mica. The works inspire one to dream, to ponder, to feel. Much as dreamers may discover hidden pictures in the clouds, abstract art irresistibly encourages the same practice. One may be lead to ponder concepts such as beauty and light and movement. Gazing at a painting, one may encounter feelings of peace or grace, joy or laughter, love or wonder. You may want to grab your family and friends to paint! What if one person's expression altered the direction of a project and others built on that? What if diverse peoples came together for the highest good of all? What if we all worked together? You are invited to bring your children, to bring your inner child to the Warren Cultural Center to get a glimpse of what could be! Gallery View of Duende As Art's "Heartland Homecoming" Exhibition at The Warren Cultural Center, Greenfield, Iowa. Our exhibition at the Ankeny Art Center has been an incredible experience. If you haven't been to the Ankeny Art Center before, be sure and sign up for their newsletter, so you can participate in their upcoming exhibitions and classes. What an incredible resource they are to our city. We have been the grateful for the experience of exhibiting our artwork at the Art Center. What is your preferred medium, and what projects are you working on? Acrylic paints and mediums are our absolute favorite because they are so versatile and lend themselves to working in layers, and in collaboration. Also the color choices and reflective mediums on the market right now, are out of this world. We’ve been painting together for three years now, taking turns painting on a single canvas and merging our personal expressions into a collective expression. Now, it’s time for these paintings to find their homes. Our collaborative acrylic paintings are currently on exhibition at The Ankeny Art Center, through November 25th. We have also created an online gallery. In our kitchen studio, we’re developing a series of round paintings. We completed a painting titled "Blue Moon", and "Red Moon" is currently on the easel. You can get a glimpse, in our online sketch book. What inspired you to make this career/avocation choice? After the second painting we painted together, we knew. We became an artist collective. The depth that our paintings began to embody when our collective stories and life experiences started becoming a cohesive visual language, was an unexpected creative experience. What people see in our paintings. It’s always surprising how many emotions and memories are evoked by color and movement. However, we do come from three different cultures, have vast life experiences, and have all decided to make Iowa home. It shouldn’t surprise us, that there are whole worlds to discover in our canvases. By intentionally slowing down and taking in the beauty, and taking time to listen to each other’s stories. Iowa skies are constantly jaw dropping gorgeous, and there are so many places here to explore. Also, making a place for creativity, in the heart of the home. For us, that’s the kitchen. The kitchen is the hub of our home, and so having our paintings up on the easel in the kitchen means that everyone who walks in becomes part of the unfolding. Creativity sparks creativity. We have been painting (Acrylic on Watercolor Paper/8x10 Inch), abstract paintings inspired by Iowa landscapes and skyscapes. We have completed six series of paintings.